When Otto Contreras discovered his passion for technology, smartphone apps, the cloud, and even the Internet were still decades away. But he still had a knack for and an interest in developing technical skills. Over the years, his expertise led to various roles in programming, networking, data management, systems analysis, and eventually organizational leadership. In a city with more than 400,000 residents, along with an additional 240,000 daily commuters and 6.6 million tourists annually, he faces a number of challenges in improving and streamlining the city’s technology infrastructure and processes. The speed of technological innovations is one. Fixed taxpayer-funded budgets is another. In planting the seeds for new relationships, Contreras has had to come up with creative ways to structure initiatives, so teams would gradually improve collaboration and communication with each other. In one instance, he launched an initiative to maintain the security of operational infrastructure and applications. However, the real goal was to develop improved security measures for integrating new applications and being prepared to accommodate the Internet of Things. Talent recruitment and retention are areas where Contreras has taken a decidedly creative approach. When he became deputy CIO in 2015, the IT department was cut by 60 percent. Since then, it has grown by 45 percent, but nine approved positions remain vacant. To help rebuild the department’s staff and its expertise, Contreras used portions of funds from some existing projects to work with recruiters to find highly skilled, independent consultants who were looking for more stable, yet challenging, full-time positions. “We were able to build relationships with individuals who had the expertise we needed and whose changing personal situations made them prime candidates. They discovered they enjoyed the challenges we presented, and four were eventually hired on a permanent basis. By being open-minded, we found the perfect fits for our needs and experts who are among our best senior programmers,” Contreras says. As he continues building the IT team, Contreras is improving processes and partnerships that will benefit the city. A recent success brought teams from IT and Public Works together to create a proprietary application. Past attempts at such an application were frequently derailed by inertia, changing budgets and priorities, and a lack of interdepartmental communication and coordination. In this case, IT developed a detailed project plan, gathered business requirements, documented business processes, and designated a hard go-live date. The departments also shared funding responsibilities (with Public Works paying for a business analyst and developers that Contreras’s teams managed). The new application was completed successfully in six months—instead of the usual two- to three-year time frame, or never being completed at all. One of Contreras’s ultimate objectives is to change the perception of IT from being a cost center to being viewed a strategic partner. To achieve this, he has undertaken various hands-on approaches, such as the Public Works project, and educating city leadership about IT’s potential and its requirements for helping to support successful projects. Contreras’s team will be ever-more responsible for connecting the city to its fundamental needs, and he is well on his way to making sure everyone knows it. Research is underway to better understand how and why users come to the City of Miami’s website so it can be transformed from static content delivery to providing practical interactive services. 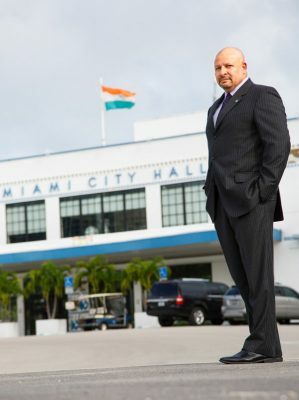 It’s one of many steps he’s taking to establish IT as an integral player in empowering citizens, streamlining municipal services, and maintaining Miami’s position as an international destination that’s positioned to take full advantage of the twenty-first century’s technological innovations. Contreras would like the city to have a data center with more robust access controls and greater security, business continuity, and data recovery capabilities. Infrastructure updated for the Internet of Things will help the city make more informed decisions—for example, street light sensors gathering data could control traffic lights and ease traffic congestion, and the city could accurately monitor rising sea levels. Miami is in the process of determining how to leverage the cloud’s reliability and support for mobile devices. Online automation will streamline processes that now require manual, multi-department reviews, such as building permits, various individual inspections, and zoning approval.